There were six workers today, Andy Lowes, Peter Ellis, Colin Foxton, Neal Woods, Ian Pearson, & Nigel Hall; also the JVs and as usual Brian Orange looked after them with half doing training in the morning while the others found out how to look after our Q6 with the workers. 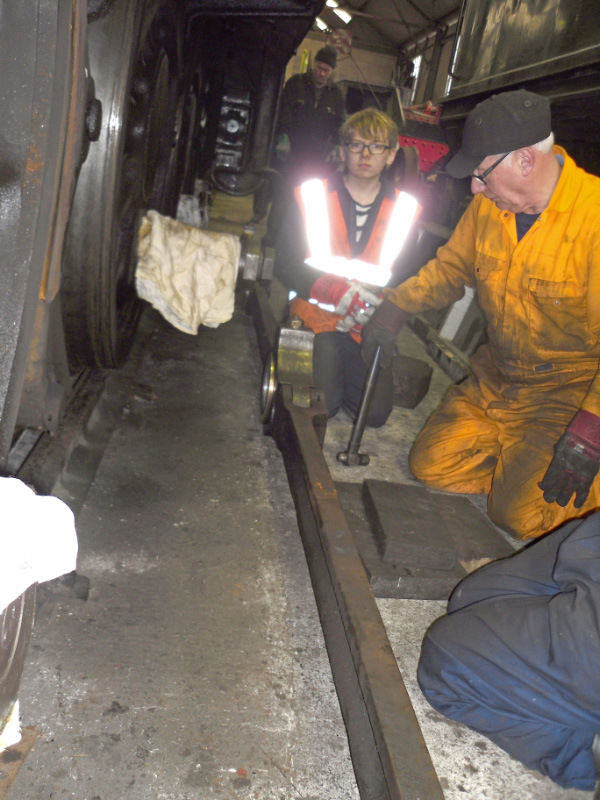 On the afternoon they swapped over so everyone got the best of both workshop training & practical hands on maintenance work. A good quantity of work had been achieved today, the blast pipe has had the carbon chipped out & the remaining mud hole doors have been cleaned by the JVs. The remaining nuts on the super heater cover have been removed in readiness to take the cover off. A start was made to remove the smoke box seal, but this is extremely stubborn to get off; I suggested doing a little at a time over the next few weeks to make the job a little easier. All the remaining sand pipes were removed, cleaned & marked up ready for storage. The last taper pin in the right side rods had to be drilled from both ends to remove it, and then it was all hands to the rods, under Neal’s leadership to remove them a little at a time until they were safely off on wood packing’s. The gradient pins were then removed & everything cleaned up. See photo 4839. 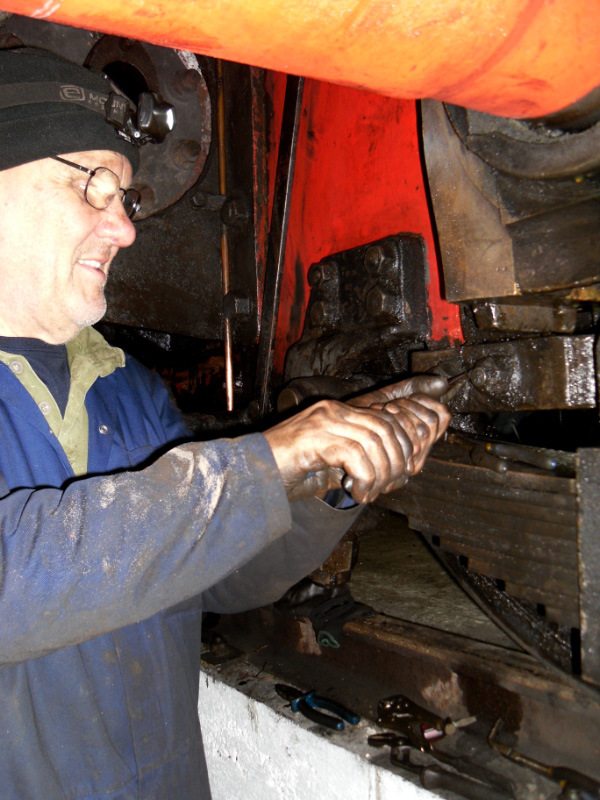 The two lower eccentric rods were removed from the inside motion work, also all the loco brake pull rods were removed by the JVs. New insulation bandage was wrapped onto the steam pipe to the ejector in the cab. 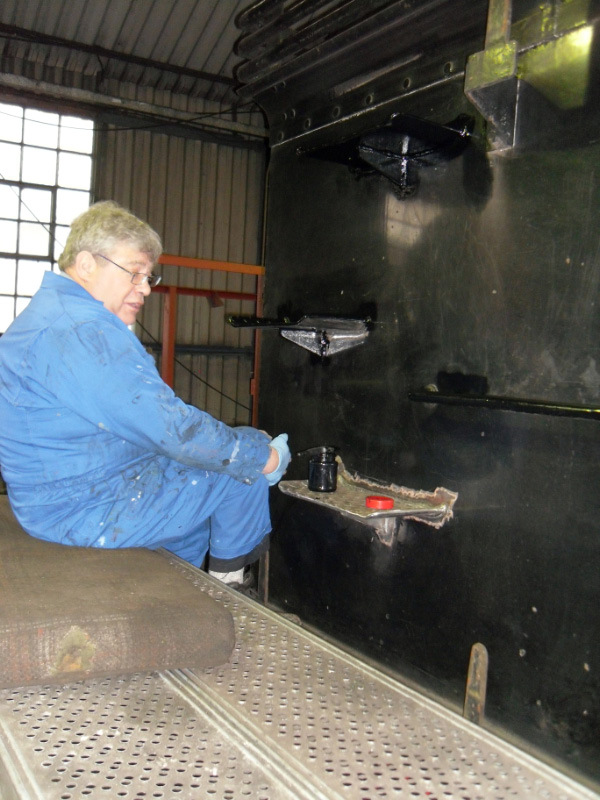 The new tender access steps have been welded by Dougie Blyth last Thursday, today they were cleaned up using a flap disc on the angle grinder & then the first coat of paint was applied. The split pins have been removed from the horn stay bolts, the trailing axle is still to do. Two new fitted bolts will be required in the left intermediate horn stay.